Yorba Linda, the Land of Gracious Living, is an apt embodiment of the LA Carpet way. At our Yorba Linda location you’ll find the same great service and commitment to excellence as you would in any of our nine locations. LA Carpet Yorba Linda grants customers access to top manufacturers like Shaw Floors, Beaulieu America, Mohawk Industries, and more. Although we offer the best in tile, luxury vinyl, natural stone, and carpets, we are more than just flooring. Countertops, cabinetry and other home accessories are offered to complement any style and design. LA Carpet Yorba Linda is a one-stop-shop for top-end flooring and home design products. Call today to set up an at-home appointment or just stop by and have a look! Located in the El Pollo Loco Center at 18432 Yorba Linda Blvd. 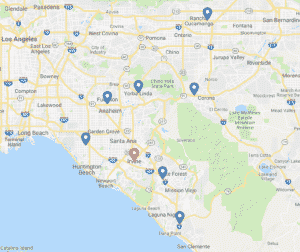 in Yorba Linda, Orange County, you will find knowledgeable service professionals and expert consultants to help you make the best decision when it comes to your home, be it renovations, remodeling, or basic upgrades. You will get patient, well-rounded service that runs from product-purchase to post-installation. Don’t feel like coming to us? Well, we can come to you with our free shop-at-home service where you can view samples and receive in-home measurements and estimate from the comfort of home. Just off Imperial Highway and Yorba Linda Blvd., directly across from the UPS Store, we’re open seven days a week and ready to serve you in all your flooring and home design needs.